This is another treasured recipe from my Amma,very simple to make ,yet so delicious..I’ve prepared this fish pickle last week with 3 pounds of king fish,and its almost over by now.Actually I was hoping that it’ll stay for atleast 3 months.Ok,no complaints..I only gulped almost half of it,eventhough I blamed Deepu for finishing it off real soon. Mix together turmeric powder,red chilly powder and salt ,adding little water and marinate fish pieces using this mixture. Keep it in a refrigerator for half an hour.Then deep fry the fish pieces,until brown and crisp. Heat oil in another pan,pop mustard seeds,add curry leaves and fry for a while.Now add ginger,garlic and green chillies into it.Saute it for 3-4 mts in medium heat. (I used store brought ginger-garlic paste instead of sliced ginger & garlic.Be careful while using this ready made paste,it can splash all over and can cause burns.So its better to cover the pan immediately after adding it,but take care not to burn the ingredients). Mix in Red chilly paste and saute for few minutes. Now add vinegar and salt and allow it to boil.When boiled,add the fish pieces into it and simmer for another 5-6 mts.You can add hot water or vinegar(check for sourness before adding it) if needed,and let it come to a boil once again.Switch off the stove,allow it to cool and store in an air tight container. For better shelf life(in room temperature),fish pieces have to be completely dipped in the gravy,and oil has to be seen on top. Otherwise you can keep the pickle in a refrigerator and always use dry spoon in the pickle,water particles can spoil the pickle. You can use any hard fish for this like tuna or tilapia.I’ve even prepared this pickle using anchovies.The same method can be used to prepare meat pickle also. This entry was posted on September 20, 2006 at 4:29 am	and is filed under Chutneys & Pickles, Seafood, Traditional Kerala Dishes. You can follow any responses to this entry through the RSS 2.0 feed. You can leave a response, or trackback from your own site. Sounds yummy, I could replace fish with something else using all the other ingredients!! Thanks!! Don’t u take fish?You can use meat or chicken instead of fish.. Thanks Maheswari.Try it out and lemme know about it. I am drooling Annita! No sleep until I make this…ha! Thanks Meena.Fish pickle is also very good,just like meat. annoose, recipe valare nannayittundu..kanan nalla rasam.. Thanks Usha,Try it out sometime.You are gonna love it. Finished cooking your fish pickle just now, taste is excellent.Already my hubby started eating away ..:)).Wanted to thank you right away.Thanks alot for such an easy recipe for such an authentic pickle. I have tagged you.Fill in when you find time. Thanks for tagging me,Rashmi.I’ll surely do it. I’ve never had fish pickle… have heard abt it though. Sounds yummy! Can this be made with any other fish like tilapia or tuna? yes Rg,You can make this with all those fishes.But I think tuna will be better than tilapia.Juts try it out sometime,u’ll surely love it. wonderful recipe… unforunately i cant get good kingfish here, what other fish can i use to make this? You can use tuna,salmon,tilapia,shrimp..anything ,but its good if you choose some kind of hard fish. One suggestion Anita. After you cut the fish for the pickle, it should be dried. Either between layers and layers and layers of paper towels or in the hot sun. If the fish is not dried, it will spoil very quickly. I guess you did not have that problem as 3 pounds fish was gone in a week!!!!. Annita, your fish pickle looks very yummy. Beautiful pictures. My mom makes fish pickle with shark fish and it is very very tasty. I love pickles but never made any by myself, always buying from the store. Your fish pickle is so tempting, so I want to give it a try. Thanks for the recipe. Could you please tell me what this king fish is called in malayalam? 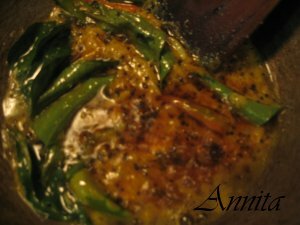 Annita I love fish pickle and since this recipe comes straight from your mum,it is a must try.Annita I wanted to know how much kashmiri chilli powder i have to dissolve in vinegar for the chilli paste? Annita, I made the achar and it came out so good. I made it yesterday, bottled it and put it in the fridge. When I tasted it I think I should have used more vinegar. How can I add more now? Do I have to unbottle everything and boil with vinegar or can I just boil vinegar alone and add to the bottle or can I just add room temp. vinegar to the bottle? Sorry for the long question. Lynn, Boil the vinegar,and allow it to cool for sometime .When it is half cooled add it to the pickle.But pickle has to be kept in the room temperature before adding it.Sorry for being late in replying. You said to add hot water or vinegar but it won’t get bad with water? I don’t want to make it very soury so thinking of avoiding the vinegar.. Little bit is fine but 1 cup might be too much for our taste..
Can anyone plz tell me what is salmon called in malayalam. Sulaiman….or solomon..hehe…just kidding….fantastic recipe btw….wanna try it soon. now a dyas im a regular visitor of your blog. Could you please add the recipe for dates pickle? Also what is this fenugreek powder? Fenugreek powder is Uluva podi..will try to add a dates pickle recipe soon.. This website of yours makes me drool like anything…this is the “hottest” stuff, found ever..keep going..I wanna try your pickles and other goodies sooner.. thanks alot..
nice&easy.. presentations,lay out & pics..
Could you tell me whether I can use salted fish for this recipe? Also instead of hot water, can I use tamarind water? This is the first time I’ve come across your site, and i already love it. I’ll be trying two of ur recipes today.But I had a question regarding this Fish Pickle; this is the first time i’ve heard of fish pickle, and i wanted to know what kind of food item does it go with? And can I substitute fish with mango? Thank you so much for the recipe. I tried with chicken as the fish shop was closed. Since I don’t have enough vinegar and most of the shops are closed (the ones open sold only synthetic vinegar)I added mango paste and cubes too with little vinegar. I have this mango for so long and it was getting softer and ripening. It came out too good! It’s almost over now :-)I made it yesterday Thanks again. I’m going to make this….Which oil is better,Annita?? I made fish pickle 30 years ago…and lost the recipe.This is the closest to it that i can remember,i,m making it tomorrow thank you so much for the recipe. It will be really helpful if you could compile a list of fish names Eg.. malayalam and their corresponding english equivalents. I always buy salmon,tilapia ,trout and king fish and use it for frying and in all naadan curries..I dont even know the malayalam of salmon and trout.. I consult your blog when I have any doubts about Kerala cooking. Nice work. Do you have a recipe for garlic pickle without vinegar(using lime juice may be)? My mango and lime pickles turn out okay but the garlic I add to the lime pickle tastes quite raw unlike the ones you buy. So I am not confident of trying the garlic pickle. Sorry Meera…I’vent tasted a garlic pickle without vinegar and i dont have any recipes for that..
Can we use this recipe to make prawn pickle ? If yes, do we boil prawns and then fry?!? Hey Annitha We (me and my mom)usually prepare the fish pickle.We use tuna instead King Fish(Which is not available here in Varkala).Your recipes are great.Try tuna pickle and reply me. This recipe ROCKS. We made in on Tuesday and it got over on Friday. I prepared it using Shark fish(Sraav). Very good, tasty and satisfying :):)…. Thanx for this wonderful recipe. Let me try this with the mussels (kallumekkai) .Hope it will rock too. Anita your recipe is great! my family n friends loved it, tho i used my own measurements. Thks for sharing a wonderful recipe. Hi, Deepak,Annita&Milan. ‘NAMASKARAM’.Hope u r fine there.I came through your Blog while searching for a receipe for Fish Pickle.I followed your receipe.But the fish i used was Tuna.The receipe was excellant by taste and quality.Thanks a lot.Away from home and family I try my skill to cook something tasty.I am from Cochin,work/living in Dubai.Regards to all, Bye now. Antony. Tried with fish, shrimp both dried and frozen and clams – have frozen some because it was a lot. Ypu list really helped. it’s yummy I eat it with plain white rice. a boque to annita.its really wonderful!!!!!! i also add little fenugreek seeds. Nice recipe. Which oil is using for the fish pickle? Can I use coconut oil for this? Please give me a reply at the earliest. Thank you…. Can we make vinegar at home? thank you i was looking everywhere for this! Just finished making fish pickle. I used fresh frozen Salmon,as it is available already cleaned and we just had cut it into small cubes. This was my first attempt at Fish pickle and it has come out really Good!!! Thank You for the recipe…. Maybe, next tim ewill try adding a little Uluva powder as so many people has suggested that in response to your recipe post…. Your recipe is simple but Really Really Yumm!!!!! My mom makes it this way. and comes out excellent. Fry the fish pieces with just a little salt. and keep a steel vessel with a cup or so of vinegar and enough salt. Put the fried fish(drained) into this vinegar straight from the fry pan. 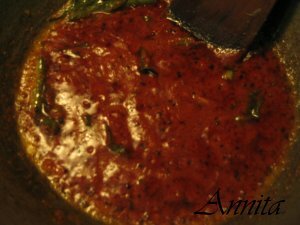 heat oil and add mustard seeds and curry leaf and then add red chilly pdr, turmeric and ginger garlic paste.add this to the fish-in- vinegar and leave it on slow fire till all the fish get smeared with the masala. add salt and/or vinegar to adjust the taste. a pinch of sugar will bring out the flavor more. BTW, great blog site. keep up the good work of creating more expert malayali cooks. This is my first time visiting your blog. Its a very nice blog. I’m yet to put my hand in preparing fish pickles. But before that a small doubt. should I cut the fish slices(as given in the shop) into small small cubes before making it into a pickle? The Fish pickle recipe is very good. But a teaspoonful of fenugreek would make a lot of difference. This is a must for any pickle. 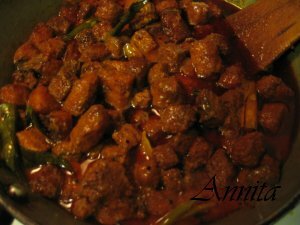 Hi, Annita, your fish pickle is so yummy….Usually I add 2 – 3 table spoons of fried prawn powder (50gms of dried prawns) to 1kg of fish pickle. And I also add 2 tea spoons of sugar. it gives a nice flavour and taste. Can we keep this pickle in room temperature for an year. If not what should be done in order to give it a shelf life of 1 year in room temperature? just made it and loooks and feels 90% ok except that i guess i added a lil extra vinegar.. hw do i reduce it ? is it possible nw? uncomfortable, it allows you to be able to lose weight successfully. They are classified as obese. Hi,Aanita,I tried this out today and did come out really well,thank!